Even though I tend to prefer gold over silver, I simply cannot resist those fabulous silver statement necklaces that take any outfit to a 10. Here are my personal favorite necklaces that will turn all heads your way. I promiss! Ahh, that’s so sweet!! Thanks for passing by and following my blog. And yes I am currently working on a new post so just wait and see! : ) Have a wonderful day. 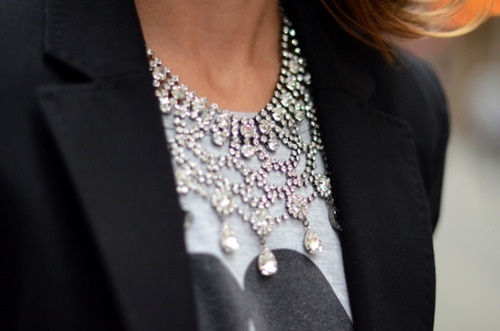 There is something chic and cool about a statement diamond necklace and a cozy gray sweatshirt that I can’t resist! Love!